A three week holiday in KwaZulu-Natal gave the opportunity for ringing as well as talks at bird clubs. Members of BirdLife Zululand attended and helped with ringing at Lake Teza and Thulasihleka Pan in Richards Bay. An article about the ringing appeared in the local newspaper Eyethu Bay Watch, see news item. 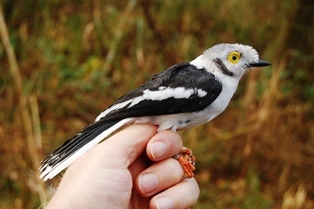 White Helmet-shrike was a ringing lifer. A ringed Lesser Masked Weaver was recaptured, and the elapsed time was 9y 0m 12d, a new longevity record for the species, see details here. 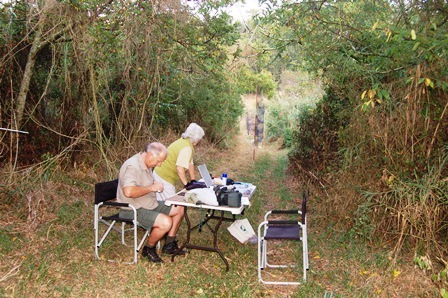 Ringing was also conducted at the Pietermaritzburg Botanic Gardens and in Hattingspruit. 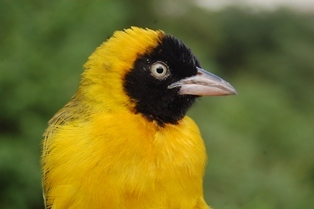 Overall, the top three ringed species were Southern Masked Weaver, Yellow Weaver, and Lesser Masked Weaver. A summary of species caught per site appears below. Thanks to the bird club members for help at the ringing, especially to Alan van Zyl, Tina Lickford, and Daniel Oschadleus. Thanks to the Pietermaritzburg Botanic Gardens for permission to ring there at short notice.